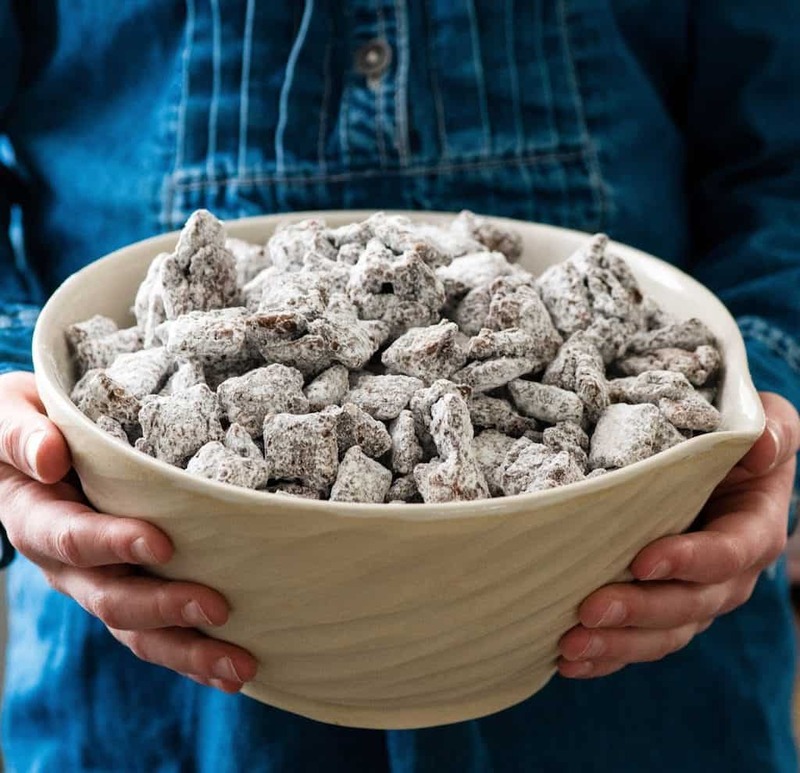 The Best Puppy Chow Recipe (AKA: Muddy Buddies) EVER! Only 4 ingredients and a few minutes results in an irresistible dessert loaded with chocolate and peanut butter! The perfect sweet treat to feed a crowd! My love language is dessert. Sometimes I even determine the amount of dinner I eat based on how much dessert I would like to consume that evening. However, in my opinion, dessert has to be chocolatey…like insanely chocolatey. Or full of peanut butter. Or, if you make me something that’s both insanely chocolatey and full of peanut butter…you’ll win me over for life. Seriously, usually the only time I eat desserts that are vanilla-y or fruity is when I’m trying to be polite…which is the opposite of my husband and kids. 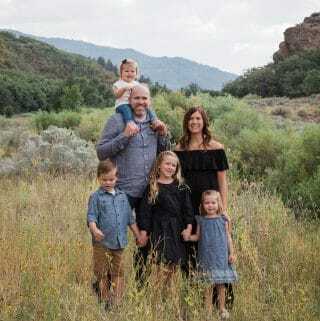 Their desserts of choice include vanilla cake, key lime pie, and gummy bears. No thanks. 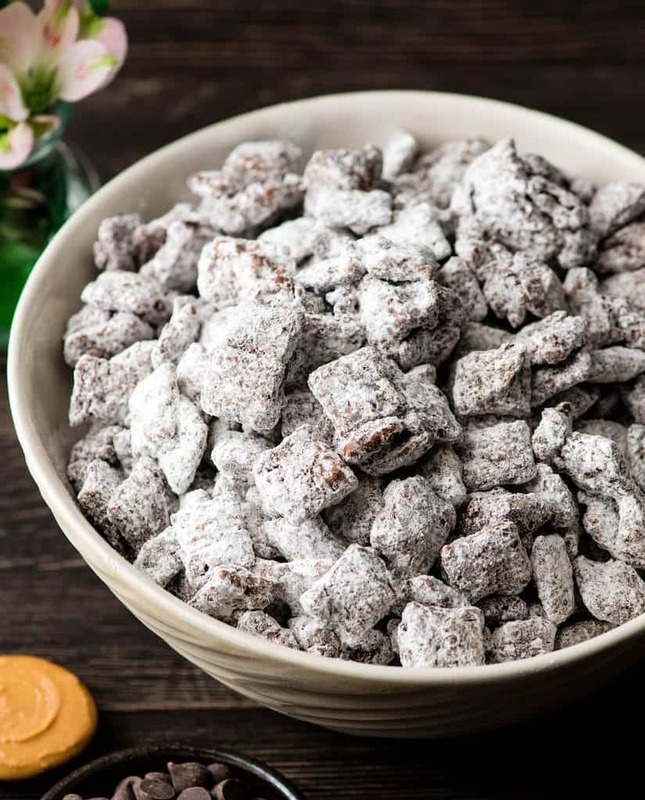 This Puppy Chow recipe meets all the criteria for a perfect dessert, and then some! Plus it’s gluten-free and dairy-free! This Puppy Chow Recipe is one of my top five favorite desserts. I’m usually satisfied with just a small amount of something sweet after dinner. However, when it comes to puppy chow, I could literally eat an entire batch myself. It’s the only treat that I consider truly dangerous (or maybe it should consider me dangerous). Listen carefully now, my version of this Puppy Chow Recipe is not for the faint of heart. You will never find weak puppy chow in my kitchen. You know what I mean? The stuff that is so thinly coated with chocolate and peanut butter that the powdered sugar barely sticks to it? Not on my watch. I want clumps, and globs, and hunks, and chunks of chocolate-peanut buttery goodness. Every step in making this recipe is so beautiful, I had to share some process shots with you! Start by melting equal parts of chocolate (semi-sweet or dark) and peanut butter together. (Look at that picture up there, seriously look). If you want it to be dairy free, just use dairy-free chocolate chips! 1. Don’t use too much cereal! Next, put some cereal in the bottom of a large bowl, pour some of the peanut butter/chocolate mixture on top, and continue to alternate cereal/chocolate/cereal, etc. until you’ve used up all the ingredients. The key here is to start VERY conservatively with the amount of cereal! You do NOT, I repeat, do NOT want to use too much cereal. It will ruin your puppy chow, and consequently, your day. Next, mix it all together, making sure the cereal is thickly coated . Then put it somewhere to cool off (outside in the winter, or in the refrigerator) before adding any powdered sugar. This step is absolutely crucial. I am not into sickeningly sweet desserts, so I like to use as little powdered sugar as possible. If you add the powdered sugar while the mixture is still warm it will soak right in and won’t help separate the chunks at all. Making sure your mixture is slightly cooled will mean you can use less powdered sugar! Once the mixture is at or just below room temperature, but not hard, add the powdered sugar until there is a thin coating and some of the pieces start separating. It’s helpful to use a bowl with a lid, so you can shake it to coat the cereal evenly. Next, let it cool down even more (for about 15 or 20 more minutes) before adding a little more powdered sugar. 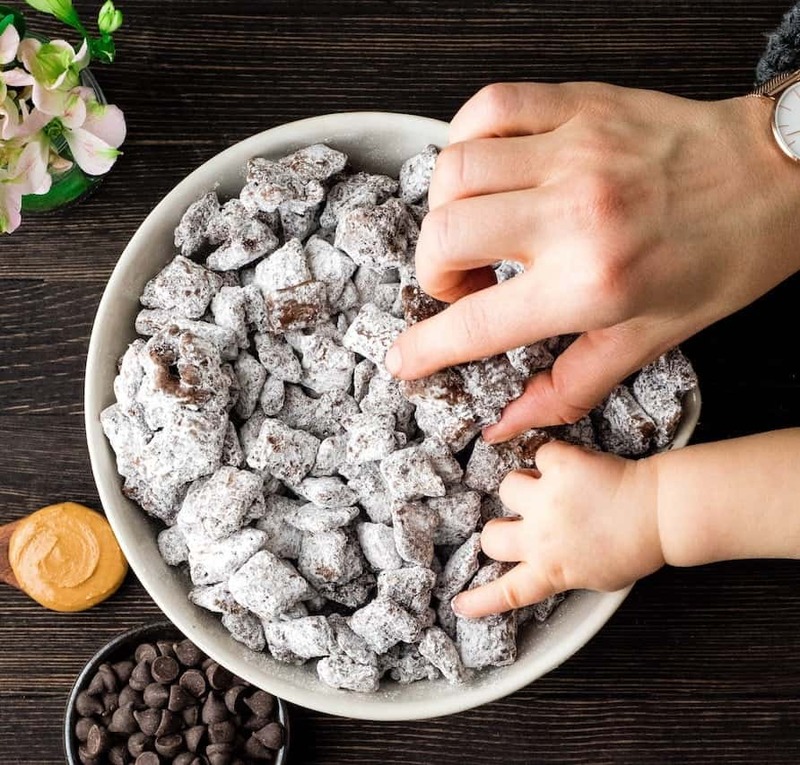 You want to add just enough so that the puppy chow can be eaten without making your hands a chocolatey-mess. I LOVE this dessert because you get the maximum amount of insane deliciousness with minimal effort. Seriously, it only has four (4!) ingredients! It is gluten-free and can be dairy-free & vegan (with the right choice of chocolate)! It’s perfect to feed a crowd too, because people can take as much or as little as they’d like! There are only 4 ingredients here people! But there are a few ways you can change this recipe up if you’d like! Chocolate. I recommend using a dark or semi-sweet variety. 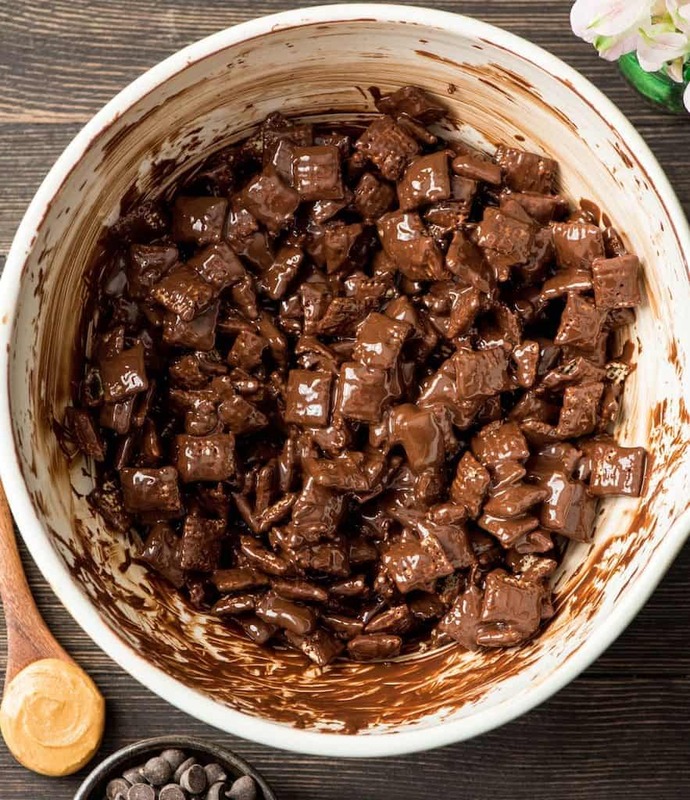 In my opinion, making this Puppy Chow Recipe with milk chocolate makes it too sweet. But if you have a serious sweet tooth by all means use whatever chocolate you prefer! If you need an allergy-friendly chocolate both Sunspire and Enjoy Life Foods make great options! Rice Cereal. Chex is my favorite cereal to use (or a generic equivalent)! However many people love Crispex! Peanut Butter. You can substitute any nut or seed butter if you’re allergic to peanuts! 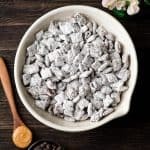 The Best Puppy Chow Recipe EVER! 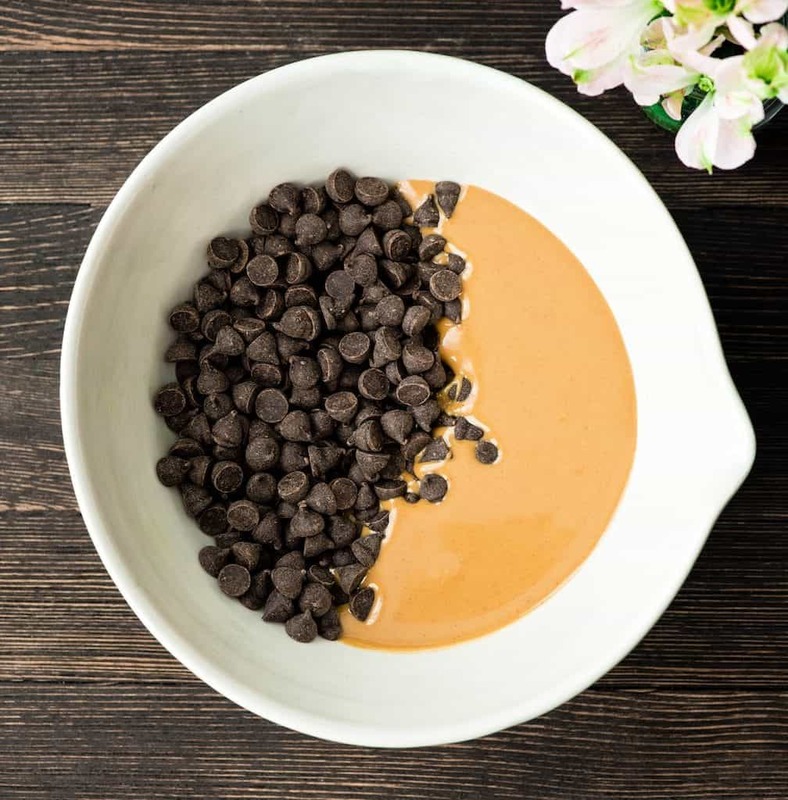 Only 4 ingredients and a few minutes results in an irresistible dessert loaded with chocolate and peanut butter! The perfect sweet treat to feed a crowd! AKA: Muddy Buddies! Plus, it's gluten-free, dairy-free, and vegan! Next, add 3 cups of cereal to a large bowl. Pour 1 cup of your chocolate/peanut butter mixture over the cereal. Stir until the cereal is evenly coated. 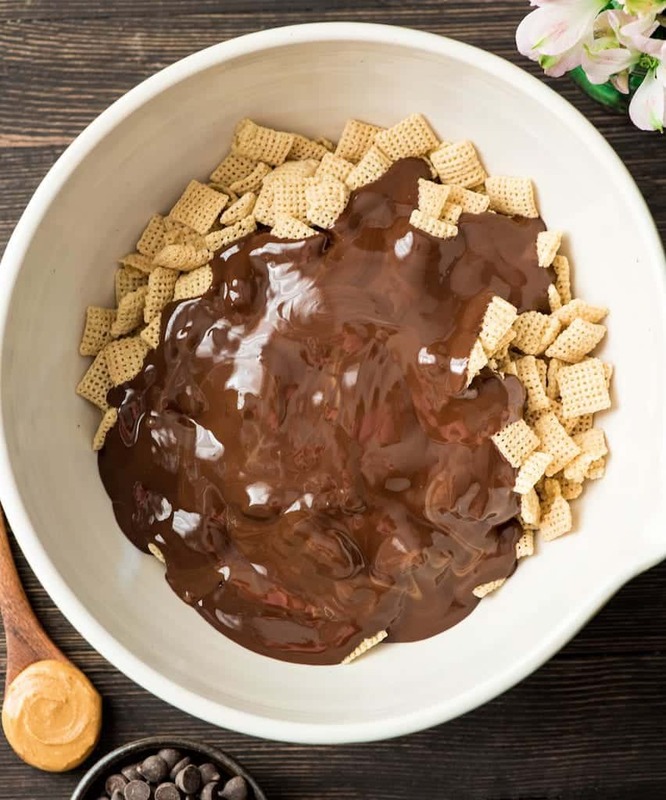 If there are pools of chocolate/peanut butter at the bottom of your bowl, add more cereal 1/4 cup at a time until all that deliciousness is coating your cereal. Remember we WANT clumps, so do NOT add too much cereal! Let the mixture cool slightly (I throw mine in the fridge or outside on my porch if it's cold out). You do not want it to harden! Once your mixture is at or below room temperature, add 1 cup of powdered sugar. Mix until combined. Store in an airtight container at room temperature, if it lasts more than 0.3 seconds. This post was originally published on February 25, 2016. It has been updated with new photos and more helpful instructions, but the recipe remains the same! Question: What’s the dessert in your life that should consider you dangerous? Isn’t it amazing the foods we use to eat at sporting competitions when we were young?! I laugh at some of the things I thought were “fuel” for my body during swim meets! LOL! 🙂 But puppy chow IS the best! If I haven’t done so, I would love to invite you over at Blogger Spotlight Link and Pin-it Party! It runs every Thursdays, 7pm PST until Tuesdays, 7pm. We pin all the entries and you will be seen on five blogs. Hope to see you there! Yum! You had me at Chocolate and Peanut Butter :). My very first kindergarten class in 1995, a little girl brought me a bag of this. I loved it! I haven’t had any since then, I’ve pinned your recipe so I can add it to my grocery list for next week. Thank you for sharing with Thankful Thursdays. That is WAY too long to go without enjoying some delicious puppy chow! 🙂 I hope it’s just as good as you remember! It appears I led an overly-under-indulged childhood: I’d never HEARD of this until this very afternoon. What is there not to love about this? Plus, those little chunks are just so doggone (pun intended) cute. Thanks for the introduction! Woof! Catching up is one of the many — maybe even the best — perks of maturity! This looks so yummy. I have never made puppy chow before. I want to try it though. love this stuff! Thanks for sharing with Thursday Favorite Things Blog hop! I love Puppy Chow and your pictures are just stunning.. Thanks for sharing! This looks really good, but why is it called puppy chow? And Thanks for sharing it on the “What’s for Dinner” link party! I haven’t made this in ages! Looks so good. I’m pinning it! My son would love this recipe! He has really gotten into cooking lately and he’s been looking for some snack ideas. I’m pinning this for him now. Thanks so much for sharing at Inspiration Thursday. Hope to see you again tonight! I just love puppy chow!! “However, in my opinion, dessert has to be chocolatey…like insanely chocolatey. Or full of peanut butter. Or, if you make me something that’s both insanely chocolatey and full of peanut butter…you’ll win me over for life. Seriously, the only time I eat desserts that are vanilla-y or fruity is when I’m trying to be polite…but I usually consider them a waste of calories and time (which is the opposite of my husband and kids, whose desserts of choice include vanilla cake, key lime pie, and gummy bears. No thanks).” —- I couldn’t agree more. We see this statement so equally well that think I love you. If only you were chocolate covered peanut butter. ???????? Have you tried making this with Neutella? Hello Michelle! There are many varieties of semi-sweet and dark chocolate bars/chips that actually are dairy free (YAY)! 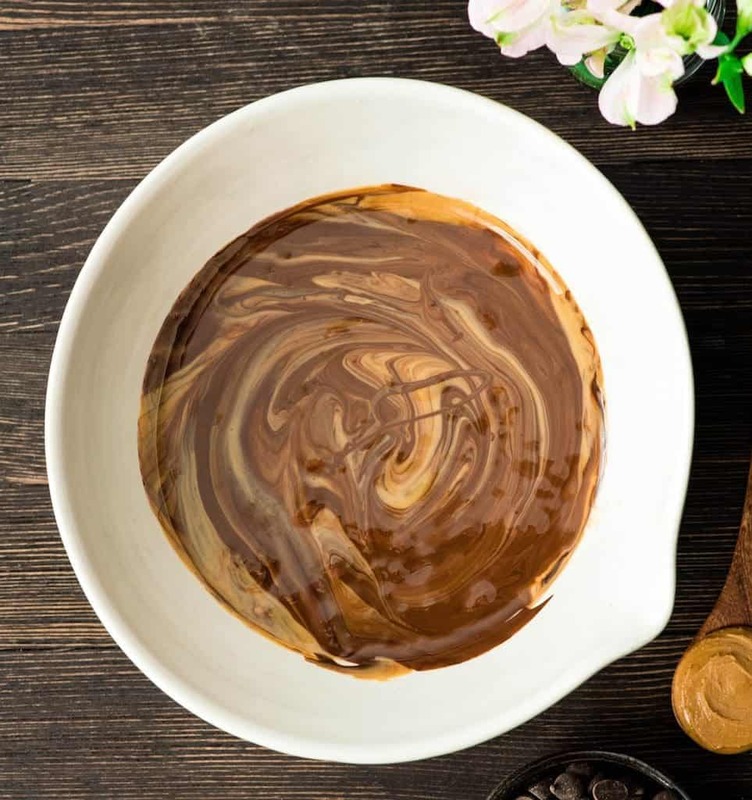 Enjoy Life Foods makes a whole line of dairy-free, nut-free and soy-free chocolate baking products! I use many of the dairy-free chocolate options listed in this article as well! ???? I hope this helps! Please let me know if you have any more questions! Aren’t these muddie buddies? The recipe looks almost exactly the same. This recipe looks good and all that but I don’t believe it should be labeled “gluten and dairy free” the chocolate chips has dairy. Hello Chelsea! There are many varieties of semi-sweet and dark chocolate bars/chips that actually are dairy-free (YAY)! Enjoy Life Foods makes a whole line of dairy-free, nut-free and soy-free chocolate baking products! I use many of the dairy-free chocolate options listed in this article as well! ???? I hope this helps! Please let me know if you have any more questions! Mine don’t! I think fir this of us who are dairy free, we understand that you need dairy free chocolate, which thankfully, these days, is easy to come by! Yay for Enjoy Life chips!!! Chocolte is not good for puppies or adult dogs; however, humans can consume large amounts of this delicious treat!! Hi Laura! As this is going around Pinterest again, it would be great if you made note in the title, or somewhere prominent, that this “Puppy Chow” is not for dogs before some idiot feeds it to their Christmas puppy and it dies from chocolate toxicity. The dogs of the world will thank you because sometimes they are smarter than their people. Mine is much smarter than I am but he would say I’m highly trainable. Thank you for your time. And for caring about our fur babies. Janie! Thank you for your concern for the puppies of the world! 🙂 I hope anyone who owns a dog would know to NEVER ever feed it chocolate! 😉 I hope you and your dog have a great Thanksgiving this week! Question…would it work as well using natural peanut butter? We’ve made the switch and I’d rather forego the added sugar and hydrogenated oil, if possible. Thanks! Yes! True story, I am actually just about to make some and use natural! 🙂 You may need a touch more powdered sugar to get it to hold up but it should be great! Hi Laura, I was curious if there were any subtle differences with the natural peanut butter, and which you preferred? I have Skippy Creamy regular peanut butter and Laura Scudder Creamy natural peanut butter in the house and was really curious about this. Thank you! Hey Jessica! I often use a brand like Skippy or Jiff to make this because it’s sweeter and my family loves it! Both will have great results though! We also use cheerios with the Crispin! It really does resemble puppy chow when making it this way! Can you use wowbutter or sunbutter instead of peanut butter? I have a child with a peanut allergy and another child with dairy allergy. Hey Jennifer! Yes! you can use any nut or seed butter of your choice! Have made this recipe twice and am officially and desperately addicted. I like to leave them in a container in the fridge though. Makes the flavor seem more crisp! I had to follow this blog as soon as I read this article and made this recipe. Also a Midwesterner, I call it puppy chow. And I couldn’t have related more to this article. I too limit my dinner intake to accomated for how much dessert I plan to devour and if I don’t have some sort of chocolate or peanut butter each night I can hardly fall asleep because I’m craving it so badly. I made this recipe for my family who loves lots of flavor and tons of toppings and it was a major success! Can’t wait to make more of your recipes. Thank you! This looks so good, I am definitely making some! Thank you for acknowledging allergies – my daughter is allergic to dairy and peanuts but that does not mean she doesn’t love a treat! Enjoy Life chocolate chips are the best and a regular staple in our home. Thank you for the recipe! This was my all-time FAVORITE snack for my girl scout camping trips. I just never made it before tonight, I have camp training this weekend and what a great memory to share with the girls! This was very simple and quick to make! I wondered if I could make puppy chow without butter but the closest I came to finding a recipe was one which called for 2 Tbsp. of coconut oil instead. Thank you for posting this one! BTW, at one time Chex cereals was owned by Ralston Purina who made Puppy Chow dog food. This snack looks exactly like Purina’s “milk-coated” Puppy Chow. 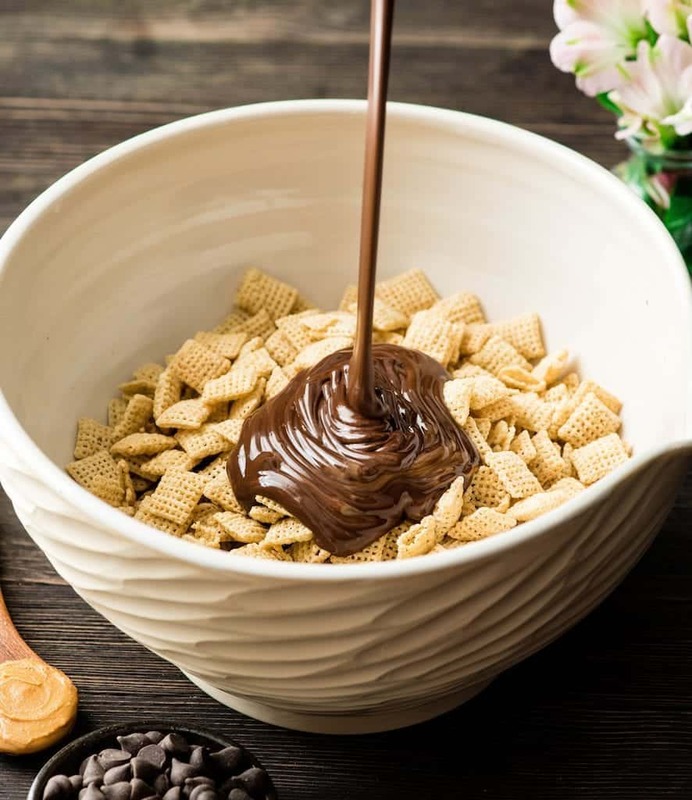 General Mills purchased Chex cereals, and then Purina merged with Nestle, and somewhere along that line the name on the Chex box recipe changed to Muddy Buddies. This recipe is delicious! I’ve made it several times and it always comes out perfectly! Oh my goodness, this is so good! Thank you for the recipe! I chose yours because it had more peanut butter to chocolate, and I’m so glad I did. Two thumbs up! This recipe was EPIC! I enjoyed the puppy chow and shared it with friends and teachers while at school. Thank you!